Change the settings that Windows wouldn’t let you alter! Veronica shows you how to make Windows7 your own on today’s Tekzilla Daily. 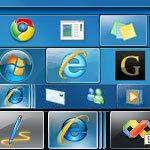 Windows 7 brings with it a whole bunch of new shortcuts. Still figuring out how to manage that revamped taskbar? Veronica has some tips to make your life easier on today’s Tekzilla Daily. Look for more useful tips like these from our friends at Tekzilla – in the future.